VapeOnly Aura Mini Battery is a tiny sized yet powerful e-cig battery! Output Voltage range from 3.3V to 4.2V,Wattage output range from 10W to 35W. The 5-click ON/OFF function makes it safer and easier to use. Simple and elegant surface gives you marvelous vapor experience. • Long Endurance: Bulit-in 1450mAh high-quality lithium battery, designed for long usage periods. • Clear and Simple Light Indicators: To help distinguish different kinds of battery modes. Vaping: press power button and inhale (no longer than 10 seconds at one time). White LED light will illuminate when you press the power button and go out once you release. Charging: simply charge the mod by connecting it with a computer or a wall adapter via USB cable. When it's fully charged, the button light will go out. Low Resistance Protection: When the battery is on, atomizer will not work if its resistance is lower than 0.3ohm when you press the power button. The white LED light will double flash 5 times with the battery going to standby mode. Low Voltage Protection: When the battery is on and the voltage is low, hold down the power button, the white and red LED light will flash 5 times each alternatively with the battery going to standby mode and not working. Then please charge your battery. Open Circuit: When the battery is on, if under open circuit situation or no atomizer is connected, the white LED light will have a single flash 10 times with the battery going to standby mode when you press the power button. Overheat Protection: When the battery is on, hold down the power button, the red LED light will triple flash 5 times with the battery going onto standby mode if the temperature of the device is higher than the setting point. Battery Overload Protection: When the battery is on, hold down the power button, the red LED light will double flash 5 times when the battery going onto standby mode if the voltage is lower than 3.5V, and the resistance is lower than 0.5Ω. • There is CE mark on the battery. Ich habe mir VapeOnly Aura Mini Battery gekauft, weil ich noch gerne einen Ersatz für Unterwegs wollte. Gerade die Kompakte ist hier perfekt. 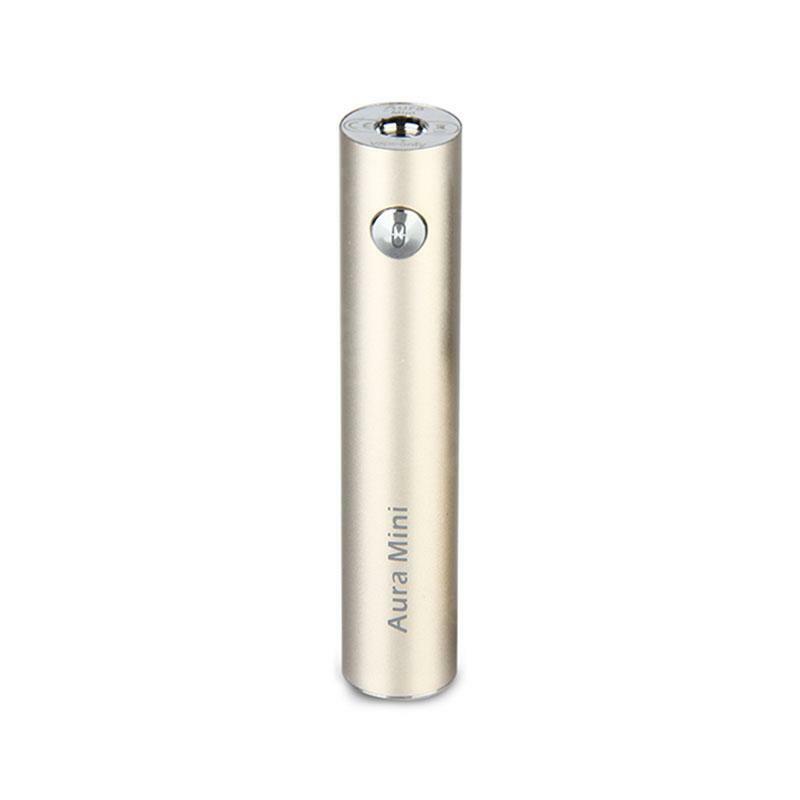 The Aura Mini 1450mAh is enough for several days' use. Easy to carry with.